AWC: Describe your business. What do you do? Why do you do it? Laura Inks: I am the Interim Executive Director of SunnyED, an educational program that pairs third grade students struggling with math with eighth grade tutors via the Internet. They begin by viewing vodcasts of our National Teacher of the Year, who explains the lessons in fun and engaging ways. The duo then work on problems together, until the younger one “gets it.” We are also developing a game, where the students can practice newly learned skills, in a fun and non-threatening way. Once the organization hires an Executive Director, I will slide into the position of Director of Community Partnerships. I am also Executive Director of the Jane Art Fund, a family foundation focused on identifying and encouraging youngsters with artistic talent and showcasing their work. Laura: I started the moment I hit Santa Barbara, 21 years ago. Building relationships, establishing credibility within the arts and educational communities, and finding partners in the business, political and foundation worlds. The SunnyED pilot program has run for two years in Santa Barbara schools. As soon as the technology is dialed in, we intend to scale the project to include the entire school district, as well as schools in Los Angeles, North Carolina and (dare I say? )…the WORLD! Go big, or go home… right? Laura: I always look to connect people for mutual benefit, no mater what project I am working on. I look beyond my own immediate needs and try to find ways for people and organizations to help one another. That is why my business is called Creative Collaboration Network. I am always stunned to see what I am able to accomplish, with the right community support. Laura: Make life fun! In my early career as an art teacher I would see what the classroom teacher focused on, in a wide variety of subjects, and see how I could create an activity that would make learning come alive for the students. “Hands on” and “fun” are important criteria for students to engage in order to own their educational experience. I believe that about the business world, too. The new paradigm in business is to have a company culture that takes into consideration the values of your workers and incorporate that into company values so employees are attached emotionally, as well as professionally. Satisfying the need to connect with others, caring about something bigger then yourself, learning and growing, are all things that give us the optimal human experience. It makes perfect sense to tie that into professional goals. Happy people, make good workers, who do good things for the world. AWC: Why did you join the Association for Women in Communication? Laura: I recently earned my Masters Degree in Media and Communications Psychology from Touro University Worldwide. I joined AWC in order to expand my knowledge of the communications sector and those who make it their livelihood. I also find that networking is a great way to learn and develop professionally, but also a way to help others with their projects. Since I know so many people, and have been active in Santa Barbara for so long, many people call upon me for ideas for projects that they are working on. I am always happy to serve as a resource. AWC: What made you and your family choose Santa Barbara? Laura: We moved here in 1991, three weeks after the birth of our daughter, Olivia. My now, ex-husband, had taken a position at SBCC and I was a stay-at-home mom for the first several years. I also had a newly adopted nine-year-old. Eventually, I became very involved with youth and families at the kid’s schools, serving on many PTA boards and also on the Santa Barbara Education Foundation. At that time we championed computers and music programs in our schools. I also taught art at half a dozen elementary schools, both during the school day or in after-school programs. Music has been a thread ever since and I helped to spearhead many musical instrument drives and am now part of the collaboration that brings Pianos to State Street for an annual event simultaneous to the New Noise Music Festival. I believe wholeheartedly, that art saves lives. AWC: How can members and friends of Women in Communication help? Laura: I would love to hear from anyone who has experience with developing computer apps, educational gaming products, mentoring programs, fundraising ideas or partnerships in any of the above. It does “take a village” and I know that together, through collaborative leadership, we can make a collective impact that will help our community solve problems and make life better for all our citizens. Laura: I use Facebook to advocate for youth activities, the arts and anything related to the Funk Zone. Laura: Santa Barbara can be a tough place to get connected. At first I enjoyed creating connections through my children’s experiences. Postpartum Education for Parents (PEP) was my first group of friends, which led to the parent co-op pre-school, The Oaks, from where I still have friends, to this day. 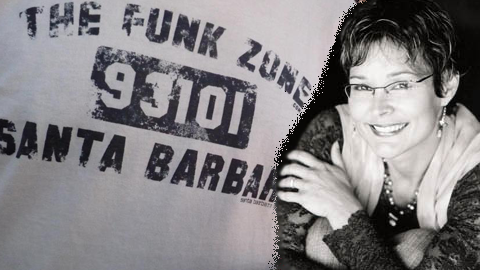 After 21 years n Santa Barbara, I am fairly well-known for being connected to arts education, youth advocacy, working with “at risk” youth populations and, more recently, for supporting the arts and artists in the Funk Zone. Laura: I guess I always thought Santa Barbara would be a great place to raise my kids, but that eventually I would move somewhere else. After 21 years here, and traveling all over the world, I have not found a more perfect place to live. I now have grandchildren here, so I guess this is really my home. There is something to be said for being a big fish in a small pond. I have close personal relationships with government leaders, educational movers and shakers, youth who are now young adults, artists and arts organizations and more. I only wish I had time to serve more organizations whose missions that I resonate with. This entry was posted in Featured Members on May 8, 2013 by Lisa.